A regal and romantic escape with candlelit dinners in the fragrant gardens and indulgent interiors worthy of the Maharaja. Unwind in style in the frescoed halls, temples, and Mughal pleasure gardens, not to mention the spa. Every February Naguar plays hotel to the World Sufi Spirit Festival. The hotel will organise camel or horse riding safaris. Hike the perimeter of the 12th-century fort’s magnificent ramparts. 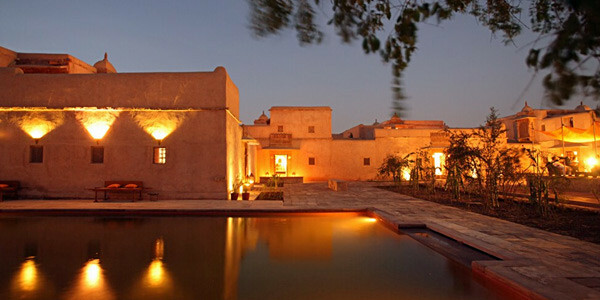 The desert towns of Bikaner, with its incredible fort and Mandawa konwn for its painted havelis are a drive away. Check out the nextdoor palace and museum complex and learn about the sites history. "10 havelis - previously the residences of queens - within the walled fourth-century Ahhichatragarh Fort, which have been fully restored and fitted with 33 bedrooms (all have private courtyards and outside living areas decorated with artisanal furnishings from the region)." "You can wander its frescoed halls and pleasure gardens by moonlight, drink in hand, and feel the pulse of history."